Hope you enjoy this review of the debut urban fantasy novel Between by Kerry Schafer as much as I enjoyed reading the book! 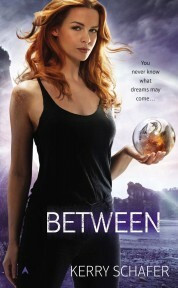 We also had the chance to interview Kerry & there are details at the end of this post on how to enter to win a copy of Between. Discovering a brand new author whose work you fall in love with is always a treat and that has been the case with Between, an urban fantasy novel by Kerry Schafer. The plot sounded interesting and different so I decided to say yes when asked to review it–it was that and much more. Being the first book by a new author sometimes means you have to give the author a little leeway–first books are often good but seldom great. But Between is an exception! This book was not only wonderful and complex and fresh, but I now can’t WAIT for the next book in the series. An incredible debut for Kerry Schafer! The main character in Between, Vivian Maylor, seems to have a normal life. She works as an ER doctor at a local hospital, has boyfriend trouble and is adjusting to a new town. But when things in her dreams seem to be bleeding over into her waking life, her life becomes anything but normal. Vivian has raised herself and her unstable mother, dealing for years with her mother’s ramblings about dreamworlds, never taking them for anything but ramblings. However, when an ER patient comes in ranting about dragons and spontaneously combusts, she starts to wonder if there isn’t more going on here than she wanted to believe. Vivian then has what appears to be a chance encounter at a bookstore with a man named Zee that she recognizes from her dreams. As if that weren’t enough to send Vivian reeling, a woman shows up at her apartment claiming to represent her grandfather who has apparently passed away leaving Vivian some strange spheres. The woman then attacks Vivian looking for some sort of key–introducing us to an incredibly evil villain. Searching for answers, Vivian goes to her grandfather’s cabin and finds herself facing dragons in a strange world known as the Between, where the line between dreams and reality is hard, if not impossible, to determine. The Between is a state between our world (Wakeworld) and the dream world, where things from each can cross over. Oh and she discovers that she is a Dreamshifter. There are so many twists and turns in this book, but I won’t give away anything more as I don’t want to spoil the discovery of this very complex plot. I love all of the characters and various plotlines–it is a unique combination of the world of dragons and princesses with the real modern world we live in. Vivian is strong and smart, but real, sometimes making the wrong choices but learning along the way. Zee is a wonderful hero, again with a reality to him despite the unreal world he finds himself thrown into. I also fell in love with Poe, who is an adorable Penguin and companion of Vivian in the Between. Do not miss this incredible debut! I will warn you though that this is a book that will keep you on your toes with numerous viewpoints and storylines all weaved together to tell an interesting story–but leaving you with questions to be answered in future books. I cannot wait for the next book in this series and to have more of my questions answered about the world of Between. Whether you are looking for a great fantasy novel, action and adventure with the future of the world at stake, a complex mystery to solve, or just great characters to fall in love with–you will love Between! Lorie: Where are you from? Kerry: I was born and raised in the town of Williams Lake, British Columbia, but I’ve been transplanted to Washington state for about fifteen years now. Kerry: I started with poetry in about sixth grade and have been at it in one form or another ever since. Lorie: Is this your first published novel, or just first novel in this series? Kerry: This is both my first published novel, and the first novel in this series. It’s far from the first novel I’ve written though! Lorie: Have you published other things (i.e. short stories, articles, etc)? Kerry: There were a couple of articles a few years back, mostly for a local publication. Lorie: Have you always written fantasy? Kerry: I’ve experimented with a variety of genres. The first book I tried to get published was a thriller, but I do seem to gravitate toward fantastic or supernatural elements. Lorie: Why did you choose to write fantasy? Kerry: While I read far and wide across genres, fantasy is definitely my true love. It’s so much fun to be able to play with elements of mythology and fairytale. I also must admit that I love to be able to create freely without worrying too much about boring things like facts and real world details. Lorie: What brought you to choose the setting and characters in your book and is it a series? Please tell me a little about the setting and main character. Kerry: Between is pretty much sheer entertainment, but I guess I’d like for readers to walk away from the book wondering a little about the nature of reality and the way dreams affect us all. Kerry: At this point in my life I don’t have time for a schedule! I just cram the writing in wherever I can make a space. Kerry: I’m trying to learn how to outline, but what seems to work best for me is to write a very fast, very rough draft. I read through that to see what ideas and plot points come up, and how my characters react to that. And then I outline what I’ve already written to see what’s missing or in the wrong place. Multiple revisions follow. Kerry: When I have days off and don’t have to go to work, I really like to start writing at about 9 a.m.. On my best writing days, I get an hour or two of concentrated work in the morning, and keep coming back to it in shorter bursts throughout the day. Lorie: Did you find it difficult to get published in the beginning? What is the story of how Between became published? Kerry: I’d been trying to find an agent to represent Between for a couple of years before the magic happened. In fact, I had moved on to writing another novel and was almost ready to put the manuscript in a drawer and give up. But I had posted a couple of chapters on an author site called Book Country, where it came to the attention of Berkley editor Susan Allison. She asked to read the full manuscript and then offered a contract! It felt like winning the lottery. Lorie: That is awesome! Most interesting book signing story-in a bookstore or other venue? Kerry: I haven’t really had any book signing events yet, but a really cool thing happened before the book was even released. I was at Barnes and Noble talking to staff about a possible signing event, and a couple of teenagers overheard us. One of them asked what the book was about and I gave her one of my bookmarks. She asked for an autograph and I signed her bookmark. I felt like I was really and truly an author for the very first time. Kerry: I plan to finish the trilogy of course! After that I have a couple of rough drafts I really want to get back to. I’d like to try my hand at a paranormal thriller and a Young Adult fantasy at some point. Kerry: That depends on what I’m writing. For Between I needed to do some medical research. I watched You Tube videos, Googled medical procedures and Emergency Room protocols, and found an ER nurse who checked my facts for accuracy and made some suggestions. Kerry: I will read just about anything put in front of me, but my favorite reads tend to be thrillers, mysteries, and fantasy. Kerry: I seldom watch TV and don’t have any current favorite shows. Favorite movies include Serenity, The Princess Bride, and The Gods Must Be Crazy. Kerry: Really, my advice is just to keep writing. If you’re really serious about your writing then make it a priority. You have to make time for it or it will never happen. Kerry: Only my thanks for your interest in me and my book! Kerry: Hmmm. I played the tuba in our high school band. 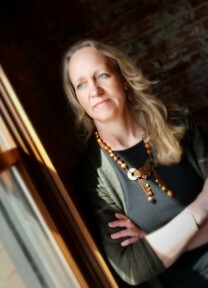 Learn more about Kerry on her website, follow her on Twitter @KerrySchafer and find her on Facebook! To enter to win a copy of Between, simply email KRL at life@kingsriverlife[dot]com by replacing the [dot] with a period, and with the subject line “Between”, or comment on this article. A winner will be chosen March 1, 2013. (This contest is for longer than usual because of the second event) U.S. residents only. Love the interview can’t wait to read the book.